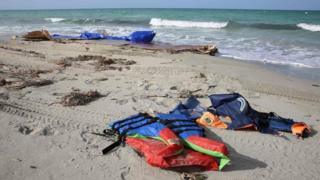 Ninety migrants are feared drowned after a boat capsized off the Libyan coast, says the UN's migration agency. But aid agencies and the UN accused European governments of taking an "inhuman" approach. From a boat carrying more than 90, only three survivors are reported - two of whom managed to swim to shore, while the third was picked up by a fishing boat. "Ten bodies are reported to have washed up on Libyan shores," the International Organization for Migration (IOM) said in a statement. Unusually, there were also Libyans among the dead and survivors of the shipwreck, reports the BBC's North Africa correspondent Rana Jawad. What's unusual about the nationalities of those on board? The EU's entire strategy to curb illegal migration from Libya onto its southern shores is built on refugees and asylum seekers from countries like Syria, Eritrea and Sudan, as well as the broader swathe of sub-Saharan African countries which generate the most economic migrants. It's largely been about border controls in the south, as well as getting the Libyan coastguard to intercept more migrants so they can be "voluntarily repatriated" to their countries of origin. As the uncertainties over the country's future as a functioning state continue to mount, Libyans are getting increasingly desperate. I've been told by a UN special rapporteur for human rights that some of the country's internally displaced people have recently been expressing a desire to make the illegal journey to Italy. Haven't the numbers of migrants reaching Europe been declining? So the numbers are comparable but this year's figures still represent a considerable bounce-back following a dramatic fall over the second half of 2017, the IOM told the BBC. Some of last year's decline can be attributed to the EU's controversial deal with the Libyan coastguard, but the IOM also believes there were difficulties within the people-trafficking industry. "We think that there was a lot of pent-up demand in terms of migrants being held in warehouses by the smugglers," said the IOM's Joel Millman.